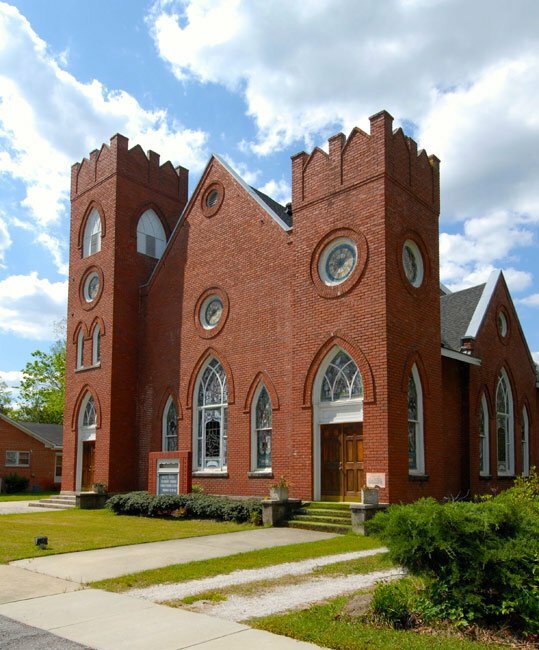 Located near the Dizzy Gillespie Home Site Park, this church in Cheraw was the childhood place of worship for the legendary jazz musician. Originally called Wesley Methodist Episcopal Church, it was rebuilt in 1915. Gillespie’s father, a brick mason, is thought to have helped with its construction. According to Cheraw Director of Tourism and Community Development David Sides, Dizzy Gillespie would wait at the back church entrance to help an elderly parishioner up the stairs and to her seat. He lived only one block away from the church, and as an adult, he often credited his experiences there as having shaped him.